Situated in the highlands of northern Thailand, Chiang Mai is one of the most popular tourist destinations in the country. Visitors come here to play with elephants, trek through hill tribe villages, shop ’til they drop at the endless night markets, or simply to use it as a stopping-off point before heading further north to Pai or Chiang Rai. Regardless of your reason for visiting, you’ll find plenty of activities to keep you entertained for several days. We’ve compiled a list of our top 7 favorite things to do in this beautiful, ancient city! Khao Soi Gai (ข้าวซอยไก่) is one of our favorite dishes in all of Thailand! While it is possible (but difficult) to find this dish all over the country, it reigns supreme in Chiang Mai. Khao Soi Gai is a coconut curry soup with a flavor profile that is similar to Massaman curry. The curry is served over boiled flat egg noodles with a tender leg of chicken. And finally it is topped with raw onions, pickled mustard greens, and fried noodles to add a bit of crunch. 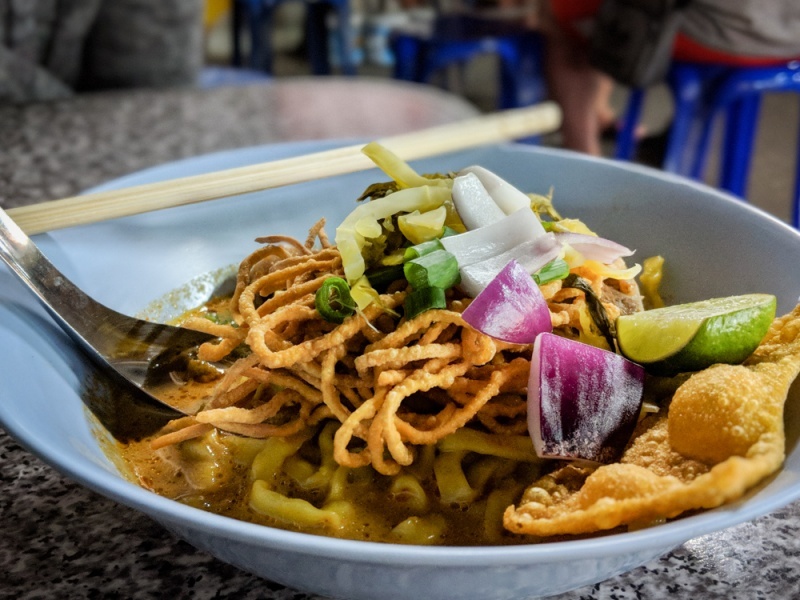 Most folks agree that the best Khao Soi Gai in town can be found at Khao Soi Khun Yai, a small outdoor restaurant on the northern edge of Old Chiang Mai between Wat Rajamontean and Wat Khuan Khama. You’ll need to arrive before 1:00pm to ensure they still have some available and you may have to wait for up to an hour for a table! If this Khao Soi excursion sounds exhausting, don’t lose heart. Almost every restaurant in Chiang Mai serves up their own version of the savory dish. 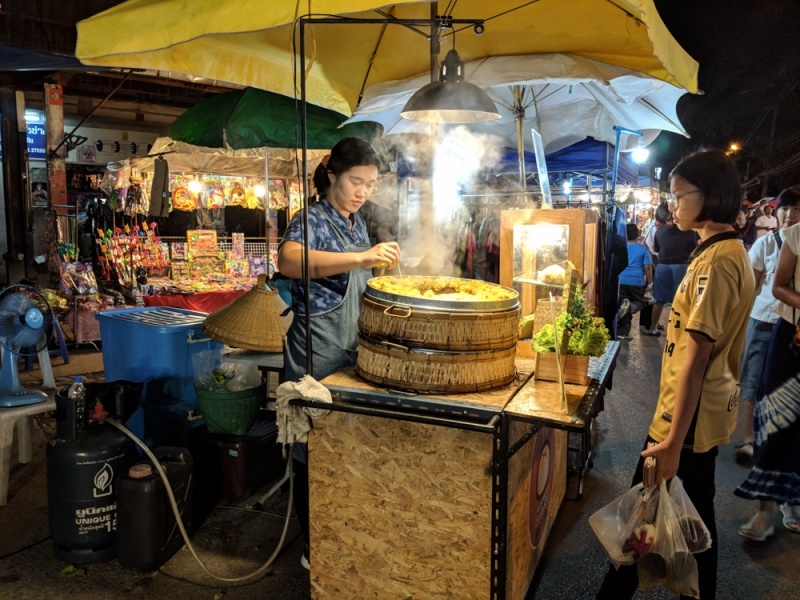 A couple of other popular spots to try are Khao Soi Mae Sai and Khao Soi Islam. Chiang Mai is well know for it’s long standing “Night Bazaar” to the east of the old city. Unfortunately it lacks some originality as most vendors offer the same standard tourist trinkets you’ll find all over the country. 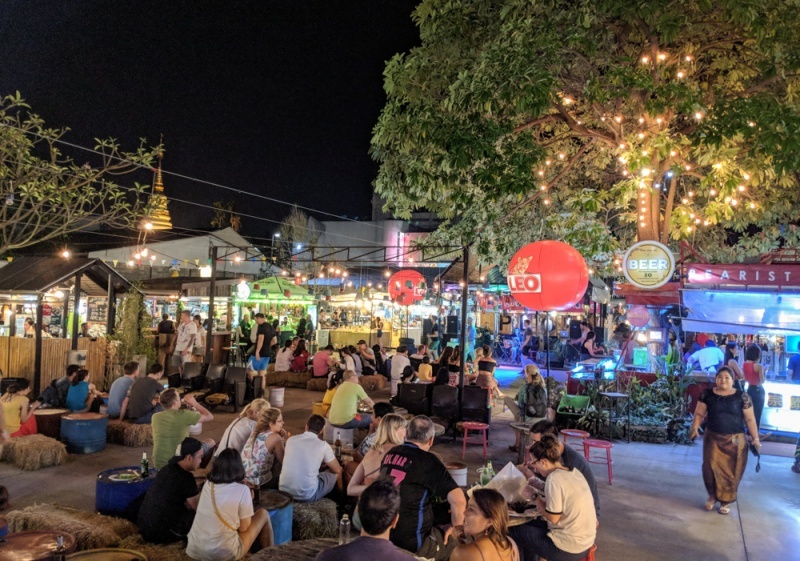 The real highlights of Chiang Mai are the night markets that set up on Saturday and Sunday night – so make sure you stick around for the weekend! 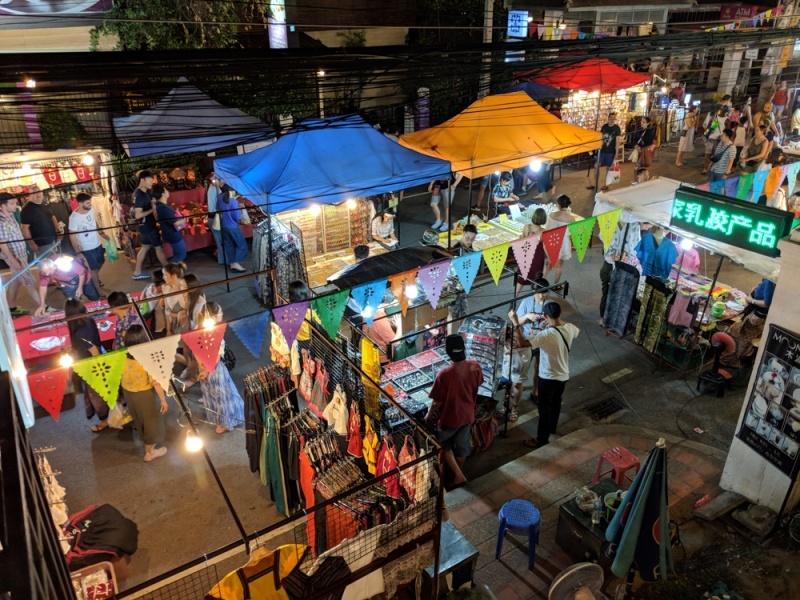 On Saturday night you find a huge market that starts south of the Chiang Mai gate and runs southeast along Wu Lai Road. You’ll find loads of high-quality goods that are handmade in northern Thailand. Delicious food stalls offer everything including barbeque seafood, rich curries, and fresh fruit shakes. 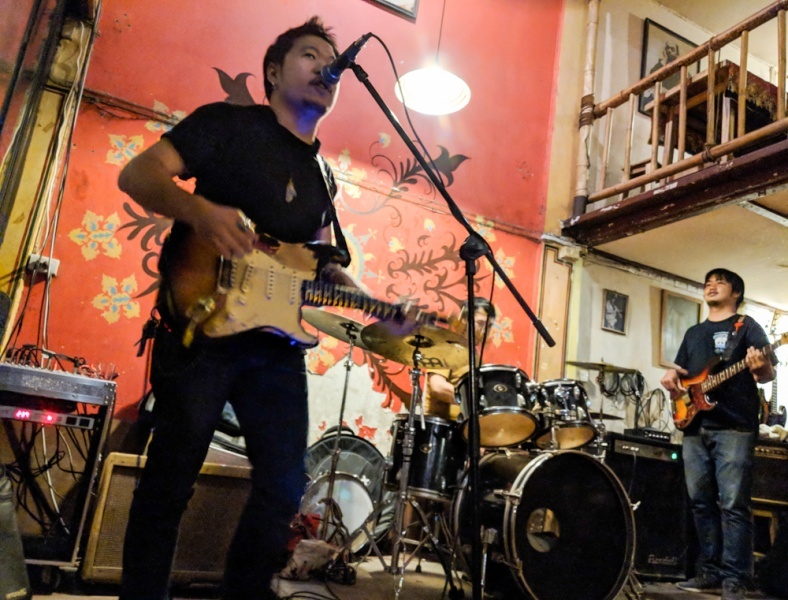 You’ll also encounter live music and performances tucked into the side streets and courtyards along Wu Lai Road. On Sunday it seems like almost the entire old city is consumed by the Sunday Walking Street Market. It primarily runs along Rachadamoen Road and Prapakklao Road but it also spills over into many of the side streets. Make sure you check out the food stalls hidden in the courtyards of Wat Phan On and Wat Sam Phao. Most of the same vendors set-up at both the Saturday and Sunday Night markets so no need to go to both unless you’re a real shopaholic. Open containers of alcohol are not allowed at the night markets, nor is smoking, so you’ll need to duck into a bar or restaurant to get your fix. If you’re more interested in good food and good music than souvenirs, check out the Ploen Ruedee International Food Night Market. You’ll find several bars serving up beer, wine and cocktails as well as a mix of Asian and international cuisine. There is something here for every taste and most nights you find a live band performing onstage. It’s open from 6:00pm until midnight every night of the week except Sundays. You’ll find endless options for massages in Chiang Mai – from high-end, luxury spas to inexpensive foot massages at the night market while people-watching. 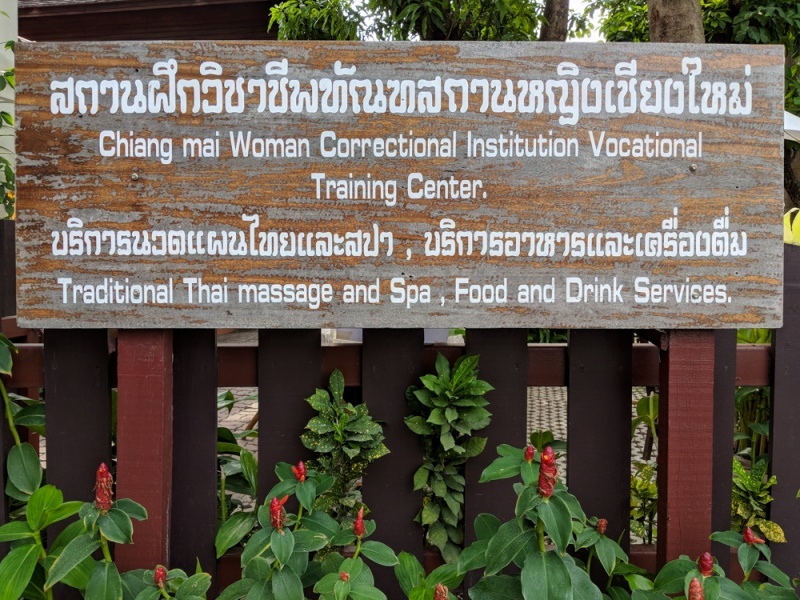 But the most popular place for a massage in Chiang Mai is at the Vocational Center for Female Inmates. The Vocational Center is located at the corner of Ratvithi Road and Jhaban Road. It’s open Monday through Friday from 8:00am until 4:30pm and Saturdays and Sundays from 9:00am until 4:30pm. Due to popular demand they tend to book all of the available time slots by mid-afternoon so you’ll want to stop by in the morning to make an appointment. There is also a restaurant onsite if you have time to kill before your massage. 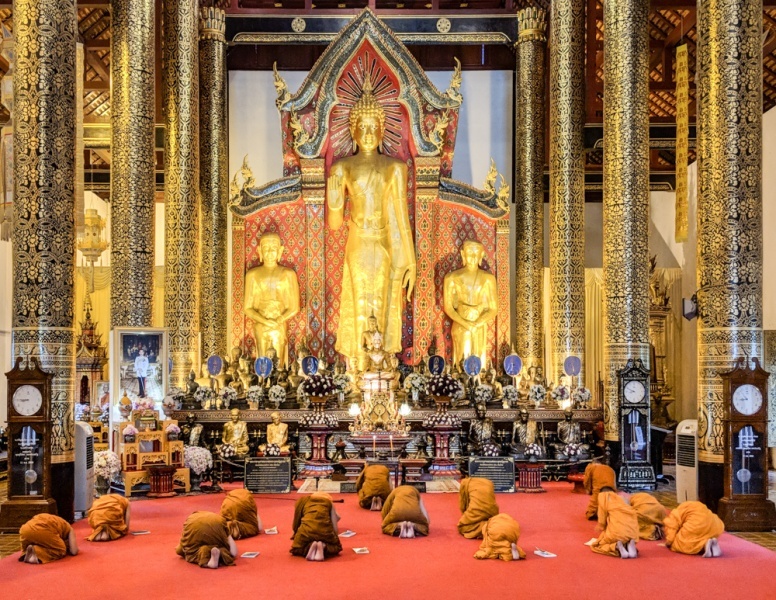 Chiang Mai has long been a religious center in northern Thailand. You’ll find dozens of beautiful, intricate temples and hundreds of monks wandering through the streets in their signature orange robes. There are also many religious festivals that take place in Chiang Mai throughout the year. A few of the temples even offer a “monk chat” where young monks make themselves available to answer any of your burning questions about their daily lives. Or just to chat about sports. They get to practice their English and you get to embrace your curiosity. It’s a win for everyone! Wat Pha Lat: Wat Pha Lat is a tiny temple hidden in the jungle of Doi Suthep. It’s typically overlooked by tourists so you’ll find the setting quite tranquil, especially if a few monks serendipitously wander through during your visit. You can either make this a quick stop on your way back to town from Wat Phra That Doi Suthep or you can hike the ‘monks trail’ from the Chiang Mai zoo. Just look for signs for the nature trail and then follow the orange cloth markers that have been tied to the trees. Wat Phan Tao: The beautiful teak Wat Phan Tao is located right next to Wat Chedi Luang. It is quite old with parts of it dating back to the 14th century. 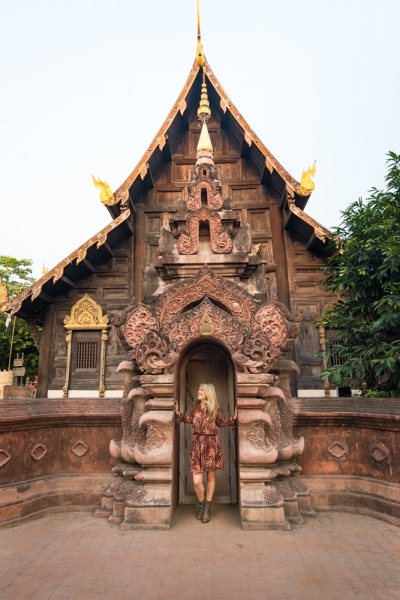 It is one of the few remaining teak buildings in Chiang Mai. Wat Phra Singh: Wat Phra Singh is a large temple located at the western end of Rachadamoen road. 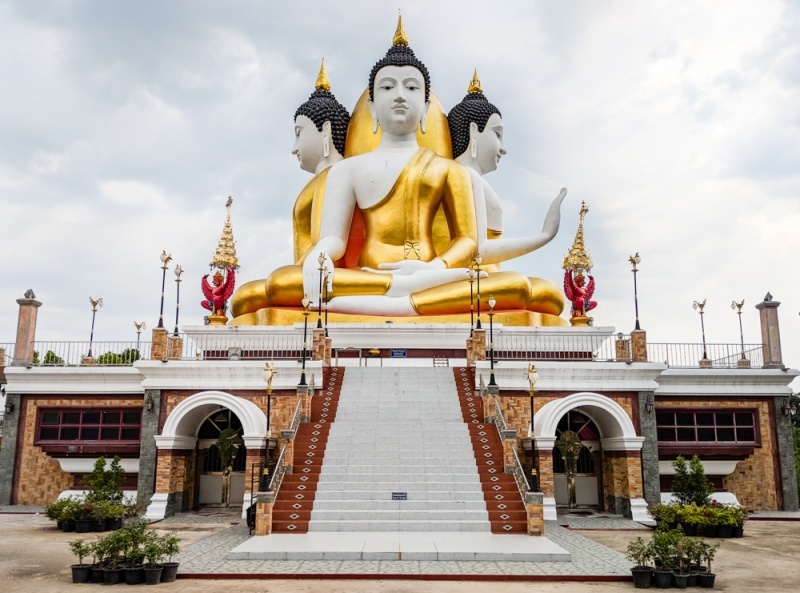 It is home to an important Buddha statue that supposedly traveled all the way to Chiang Mai from India via Sri Lanka. It’s nice to wander around in the evening when giant golden chedi is lit up. 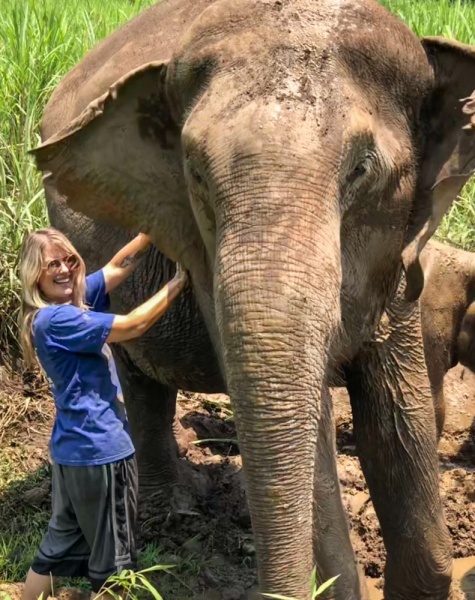 Bathing, feeding, and playing with elephants in their natural habitat is one of the top reasons that people venture to Northern Thailand and very well may turn out to be the highlight of your Chiang Mai itinerary. Most of the animal excursions in Chiang Mai have adopted more of a conservationist approach to interacting with wildlife. “No ride, no hook” is the common phrase you’ll see echoed by the ethical elephant sanctuaries in the area. You can choose a half day, full day, or overnight adventure depending on your preference. Regardless of your choice, you’ll be picked up at your hotel, and then driven the hour-or-so outside of town to their property. You’ll be given a change of clothes and then will have the opportunity to feed and bathe the elephants. It’s an amazing experience to be able to get so close to these massive creatures. And finally, after a few hours, you’ll be served a light lunch and then transported back to your hotel. While it’s unlikely they are all “sanctuaries” (how many elephants are really roaming around northern Thailand needing to be rescued? ), these spots allow the elephants to roam freely and do not allow riding. And there are still some elephant excursions around Chiang Mai that don’t treat their animals so humanely so make sure you double check before you sign up! 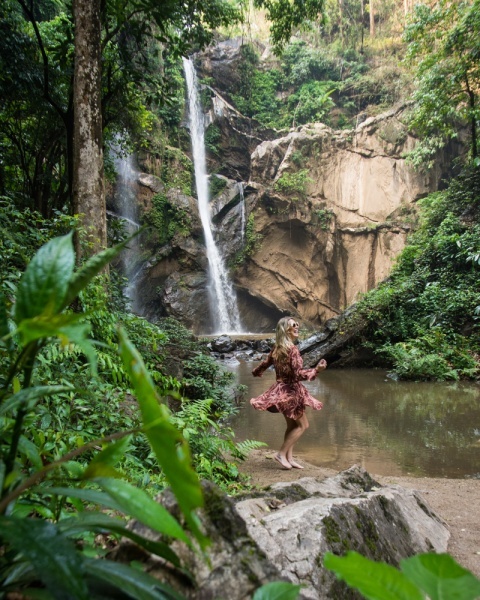 Chiang Mai is surrounded by mountainous jungle and with that comes a plethora of waterfalls. Our favorite is Mok Fa Waterfall even though it is a bit of a trek to get there. Mok Fa is located about 30 miles northeast of Chiang Mai. The easiest way to get there is to rent a motorbike and drive yourself the hour and a half. If you’re planning on visiting Pai you can arrange for a stop at Mok Fa as it is on the way. The falls are open to visitors from 7:00am until 6:00pm everyday. The entrance fee is 100 Baht for foreigners and motorbike parking is an additional 20 Baht. If you arrive during the middle of the day you likely find plenty of people picnicking and swimming under the falls. If you’re there in the early morning or late afternoon you’ll probably have it all to yourself. 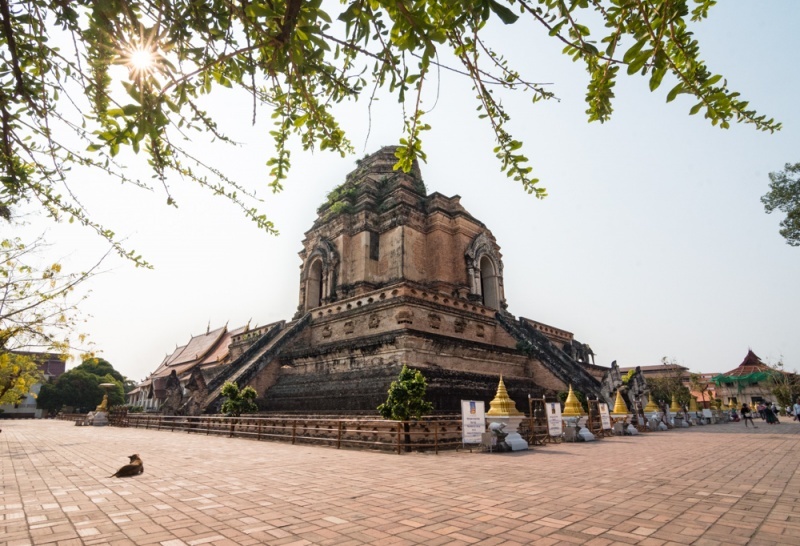 On your way back make sure you stop at the impressive Wat Nong Khong. You’ll easily spot the 4 massive Buddhas as you approach the intersection of Highway 107 and Highway 1095. Most people don’t associate Thailand with jazz music but you’ll find some great live music every night at the North Gate Jazz Co-op. It’s a tiny venue with a simple drink menu and most nights the crowd spills out onto the street. 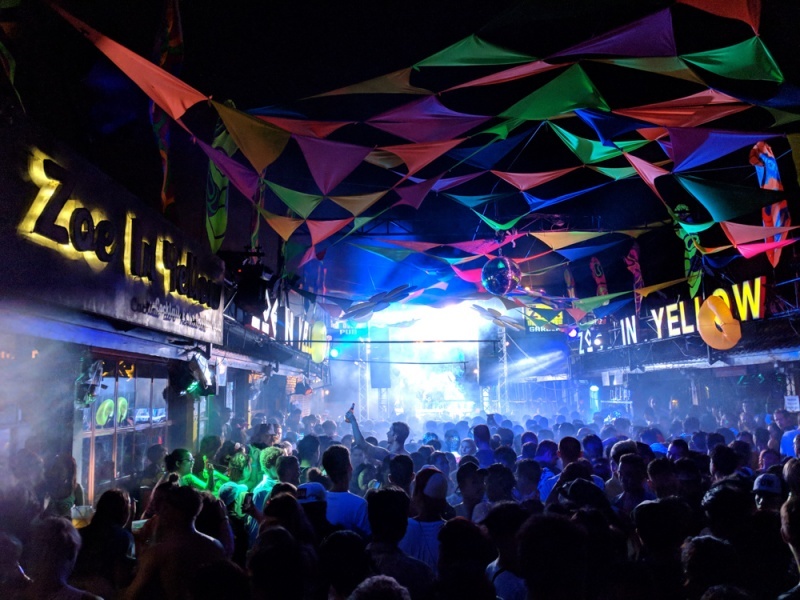 If you prefer to check out the Chiang Mai club scene, then the biggest party in town is at Zoe in Yellow. Be warned that anyone over the age of 21 may find it loud, sweaty, and claustrophobic. 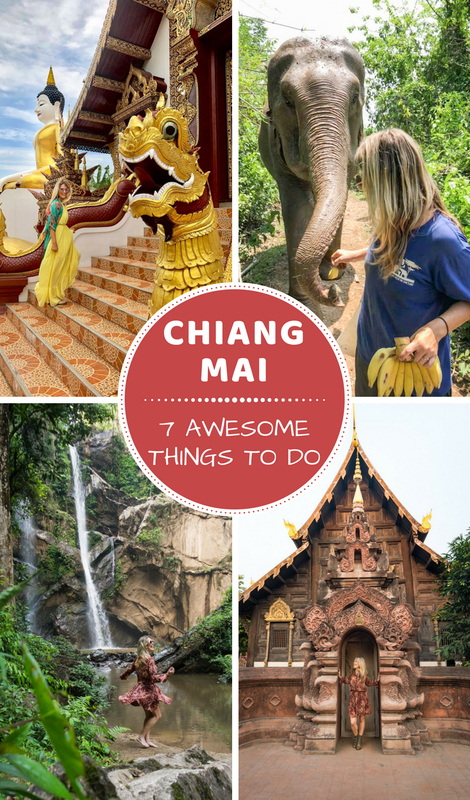 Looking for more ideas of what to see and do in Thailand? Check out our favorite books!